A delicious, healthy & comforting tomato soup thickened with blended white beans. Leftovers are great for packed lunches! Vegan, gluten-free, and simple. It’s been a soupy week around here. I’ve said it probably one hundred times before, but I just love the process of making soup. It makes me feel grounded and fancy all at the same time. Simmering flavorful things in a pot (with a glass of wine on the side) is my idea of a perfect night. It could be Tuesday night, it could be Friday night – it doesn’t matter to me. I made this one last weekend when my mom came to visit and again a few days later for Jack who had been out of town. The best part about all of this soup making (and testing and shooting) is the leftover lunch soup – because second day soup is where it’s at. Trust me, you’ll want to make extra and store away the leftovers for lunch all week. It gets better and better. 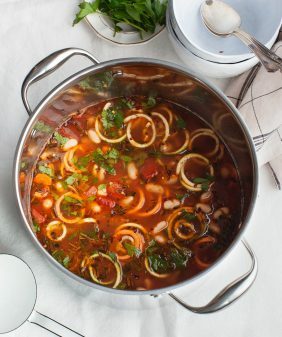 Because it’s the middle of winter, I used canned tomatoes, which makes this soup “soup-er” easy (get it? also – I’m so sorry). I thickened the soup with white beans (half blended and half left whole for texture). For extra creaminess, I also blended in some raw cashews. If you’re looking for a lighter more tomato-y soup, you can skip them – I actually like it both ways, depending on what I’m in the mood for. Heat the oil in a large pot over medium-low heat. Add the onion and a few generous pinches of salt and pepper. Cook for a few minutes, stirring, and then add the garlic and carrots. Cook until the onion is soft and translucent and the carrots begin to soften, 8 to 10 minutes. Add the tomatoes, breaking them up in the pot with a wooden spoon. Season with more salt and pepper and cook for 8 more minutes, or until the tomatoes cook down and continue to break apart. Add the wine, stir and let the alcohol cook off for about 1 minute. Add the cashews, if using, HALF of the white beans, the thyme sprigs, the broth and simmer for 20 minutes, stirring occasionally. Remove the thyme sprigs from the pan and carefully pour the mixture into a blender, working in batches if necessary. Blend the soup then season to taste with salt, pepper. If the soup is too thick, add a little more broth or water. Pour the blended soup back into the pot. Add the remaining beans and the spinach and simmer over low heat until the spinach is wilted and the soup is hot. Season to taste and serve. Other options - add balsamic vinegar for a brighter soup or Parmesan cheese for a richer soup. I’m so with you. Nothing beats the relaxing process of cooking up a pot of cozy comfort. And wouldn’t you know. . .tomato soup happens to be one of my favorites (to eat. . .I probably should cook it more often). I love how you jazzed up this tried and true favorite with beans and spinach. And adding the cashews.. .now that is a unique idea. 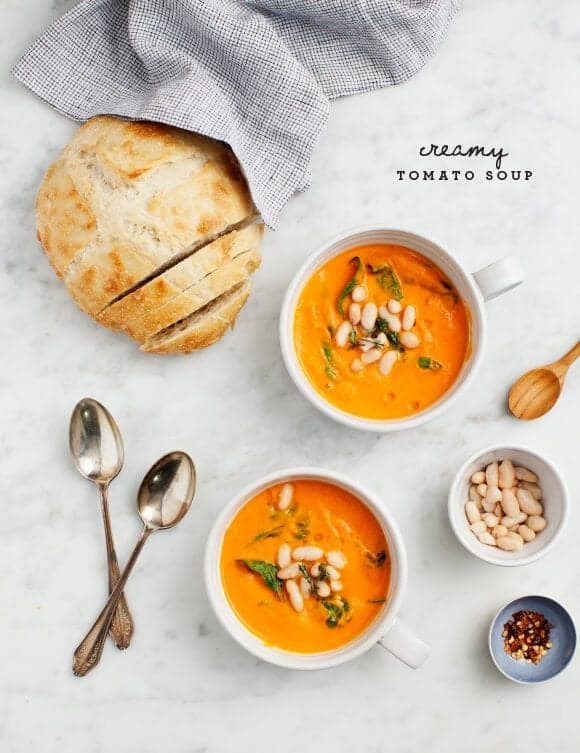 This looks delicious, it makes something as simple as tomato soup seem so much more hearty. It might even con my SO into eating cannelini beans. I love the idea of cashews in there. I need to try this. I love tomato soup, but its just so heavy. I love this lighter version! Wow – I am going to make this tomorrow night for the family holiday party we are hosting! I had a plan, but it’s going out the window as this is the perfect addition to the menu. Thank you! 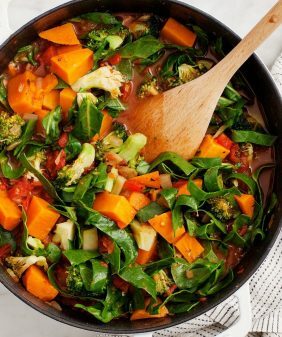 (And also eating your sweet potato lentil curry for lunch – amazing – and looking forward to trying the butternut stuffed shells in the next week!). Our taste buds are aligned. Ha, hope you and your family enjoy it 🙂 and I’m so glad you liked the sweet potato lentil curry! You can just skip the nuts – it’s good without them too. If you want to blend in extra beans you can, but I would blend and taste it and then decide. This soup looks fantastic. I love the idea of blending half the white beans for thickness and texture. If using the raw cashews, do you soak them overnight? Hi Mary, it helps, especially if you aren’t using a high powered blender. (In the Vitamix, I often skip the soaking step). Since there are so few in this recipe it’s not totally necessary but if you think of it ahead of time it would help the soup become more creamy. Looks fantastic! I’m such a big fan of tomato soup so this looks lovely! Second day soup is definitely where it’s at! And I like your idea to add both cashews and beans. I usually think of using one or the other but why not together. 😉 Certainly makes a complete and creamy meal out of an easy soup. My favorite tomato soup is tomato basil. 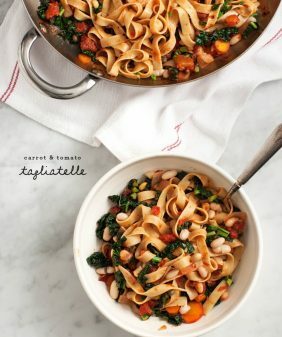 Can I use fresh basil in this recipe and if so, how much would I use to get that great tomato basil flavor? Yep, basil would be delicious – I’d add it at the very end right before you blend the soup – a handful (6 leaves or so), or more to taste! i made this as directed except added a little bouillon, used 1 tsp dried instead of fresh thyme, and added about 8 fresh basil leaves right before blending as i am a huge fan of tomato-basil pairings. it was REALLY, REALLY GOOD. i sprinkled a little nutritional yeast on my portion. i think next time i will add more whole white beans at the end. so excited to make this again. thanks! Thanks Eva! So glad you liked it! 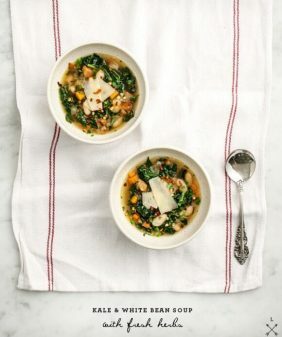 I love soups during the winter months and this sounds delish. I am going to be making it in the crockpot though. I bet it will come out stunningly. Thanks for sharing. This sounds wonderfully delicious! Enjoying your lovely blog! Just finished making the soup and tasted it! It’s very good; I am sure I will make this recipe again and again. white beans and thyme in a tomato soup is heaven! adding this to my list of must make winter recipes!! This sounds lovely! I’ll have to give it a try. Thank you for providing inspiration. I used to make something similar with roasted red peppers, but they don’t agree with me so much anymore, so I shelved that recipe. I find I get in the rut of cooking the same things over and over again, and I love your blog for the inspiration to try something new that is healthy, and yummy and meat free! Happy Holidays! I blended all the beans and my family really liked it. Thanks v much! This was SO good! I made this a couple weeks ago and my husband keeps asking when it’s next on the menu. Can’t wait to try more of your soups recipes! 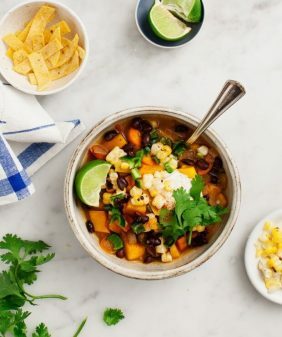 I have never come across a bad recipe on this site so far, so it’s no surprise that I LOVED this soup!!! 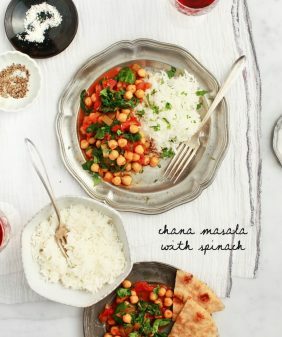 It was so flavorful and hearty, and it makes a large amount so I had this for dinner all week and I never got sick of it. Really reeeeally tasty and the ingredients are simple and inexpensive, will definitely make again! I made this soup today, so for those of you who are just eyeing the recipe: Just do it! You’ll love it! Next time you will double the recipe to have leftovers. This soup was absolutely delicious. I made it today for dinner, and both my mom and I, and we loved it. This will surely become a staple soup in our winter diets! soup was a HUGE success. I am addicted to tomato bisque soup and this is such a healthier alternative. Husband and best friend approved! We added whole grain croutons and top and added basil and red pepper flakes so it had a nice kick to it! Hi Katie! So happy to hear – thanks for sharing! I just made this soup for dinner tonight. It was delicious! It is my favorite homemade tomato soup to date, and I’ve tried a ton of recipes. Thank you so much! I will definitely be making this again. hi! i made this soup tonight and it’s delicious! based on what i had on hand, i used balsamic vinegar vs white wine, chicken stock, chopped tomatoes, and no spinach. it was a hit, but the texture of the soup was a little grittier than i would prefer, almost like the cashews didn’t blend entirely (I used an immersion blender). yours looks pretty smooth in the photo – any tips for the next time? thank you for the recipe! it will definitely be repeated. Hi Carol – I’d suggest using a regular blender to get the cashews entirely pureed, or you can just skip them… I think an immersion blender is good enough to make the white beans (and other ingredients) creamy, but probably doesn’t puree the cashews enough. I hope that helps! Glad you liked it! Made this soup last night and it was absolutely delicious. I didn’t have spinach on hand, so used kale instead and it still worked out great. Surprising depth of flavor for relatively simple ingredients. This was my first recipe from your site, and based on results I’ll definitely be trying some of your others — thanks so much! This was my first time to your website, and I found it looking for a soup like this one. I wanted a heartier tomato soup and here it was! I blended the spinach and beans, added the parmesan, made a side of grilled cheese sandwiches, and my 2-year-old gobbled it up. It’s a flavorful way to get in alot of vegetables. I’ll be making it again for sure! Hi Bree – I’m so glad you and your 2-year old loved it!! I made this soup for dinner last night without any changes – including the cashews. It was delicious! I am so looking forward to having a cup of it for lunch today with a grilled cheese sandwich. Yum! Hi Patt, that makes me so happy to hear! Glad you enjoyed it! Hi Tally, a regular (upright) blender will also work also – but yes, if you have a vitamix, I highly recommend going that route to make it smooth and creamy! Excellent soup! You nailed it again! Just found this recipe and was a great use of veggies that I had on hand. I used a mix of cherry tomatoes and regular tomatoes from my garden. I cut the cherry tomatoes in half before dumping them in. I also skinned the regular tomatoes and cut those in half before adding. It worked really well. We will be making this again! Thanks! I’ve made this recipe several times now over the past 6 months or so since I found it here. Excellent every time! With or without the spinach or other greens wilted into it. With some of the beans left whole as written, or completely blended smooth. With or without the onion. With fennel bulb substituted for the onion. With celery substituted for fennel bulb. With basil instead of thyme. Always good, always satisfying. Thank you for such a great recipe made with simple have-on-hand ingredients! Hi Carol, I’m so happy to hear that this one is in your regular rotation! Thanks for the suggestions, your alterations sound so delicious! Oh. My. Gosh. This may be the best soup I have ever eaten! Thank you so much for a fantastic recipe and such a beautiful blog. Yay – I’m so glad you loved it! This is a great soup. Very versatile ~ the leftovers makes a fab pasta sauce! p.s. – Fresh herbs are always preferable, but since I didn’t have fresh sprigs of thyme, I just used dried thyme and it still tasted great. Just saying so people who feel like they can’t make a particular item like this aren’t discouraged if they don’t have all spices in “fresh” form. Thank you for this recipe, fantastic! You’re welcome, glad you enjoyed! Yep, it’ll freeze well! Just made this for dinner, it is amazing! Thank you so much for sharing the recipe. Hi Holly, thanks for coming back to let me know! I’m so glad you enjoyed it! I wanted to make this for my wisdom teeth extraction recovery so I pureed the whole thing and it’s so good! Thanks for the recipe! Thanks for the recipe. I made this soup today, and it is delicious. I have always liked cream of tomato soup, and this is really good. I don’t miss the milk and butter. I used a vintage Oster blender and would suggest blending a cup at time. The soup comes off the windows and wood work fairly easy if one chooses to push the limit. Hi Kathy – ha, I hope it wasn’t too messy :). So glad you enjoyed the soup! I loved ot! Nothing beats a cozy soup at the end of a busy day! I added heaps of chopped parsley right before serving because that’s what we Bulgarians do, and it turned out perfect! I’m so glad you enjoyed it! I’ll have to try it with parsley next time! I have to carb count, being Diabetic. Do you have the nutritional info for this recipe? Thanks! Omg! This soup is so good, so filling, so healthy! I love it. Only had red wine and it would perfectly. Going to make this over and over. Do you happen to know the nutrition facts for this soup? Calories per serving? Going to try this recipe tonight!! Hi Karen, I don’t calculate nutrition #’s but there are lots of sites where you can plug in the ingredients and get that info. Sorry! I made this without the cashews because I didn’t have any. Added a pinch of cayenne and a splash of cream at the end. SO good. Best tomato soup I’ve ever tasted! And the beans make it filling enough for a dinner. This is going to be a regular recipe at our place! Hi, this looks amazing! Can you use canned beans? Thanks! Yep, I used canned beans! Works great. I did and it turned out great! I love this soup! 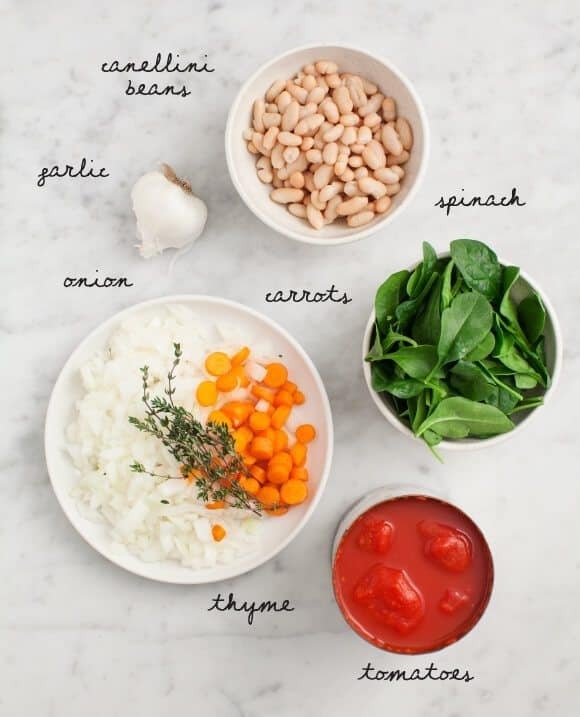 I add all the beans and spinach in prior to blending…my kids will eat them that way! I also add in about a 1/2 cup of parmesan at the end, and then garnish with parm on top, too. Serve with crusty bread. A family fave! Hi Jocelyn, I’m glad you all loved it! Thanks for coming back to let me know! Made this tonight and it was a hit! We didn’t add the beans at the end – easier to hide them when they’re pureed! So good.. will be going on my meal plan rotation. Hi Lindsey, I’m so glad you loved the soup! I used an immersion blender for this recipe. It’s easy to soften cashews quickly-measure the amount needed for the recipe-place in small pot, cover with water and add a squirt of lemon. Bring to a boil, remove from heat and cover. Let sit for 15 minutes off heat and drain. Cashews will be soft and will be easy to blend in the soup. Easy to prepare recipe-I did add some red pepper flakes-we like our soup spicy. Hi Dianne, I’m so glad you enjoyed the soup! Thank you for the tips about using the immersion blender! Eh, I just found this underwhelming/it was just not what I, personally, was looking for. I want my tomato soup to taste like tomatoes and (not surprisingly), this one tasted more like blended carrots. I didn’t love the taste of the white beans blended in and didn’t find that they made it creamy in any way. I think next time I’d use no carrots and not blend the beans in. Overall, it kind of just tasted like I was trying to make something healthy, not something delicious. And veggie soup can be delicious!